InfiniteBody: Who is this body? Anabella Lenzu at La MaMa Moves! Who is this body? Anabella Lenzu at La MaMa Moves! not the body of a 25-year-old." 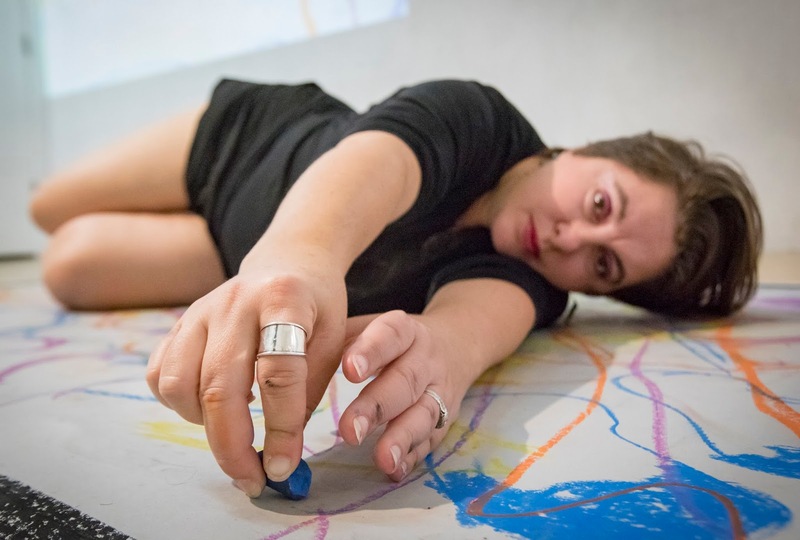 What I most appreciate about Anabella Lenzu (Anabella Lenzu/Dance Drama), whom I have known since she took my dance writing course at New York Live Arts, is how fully she inhabits the moment. 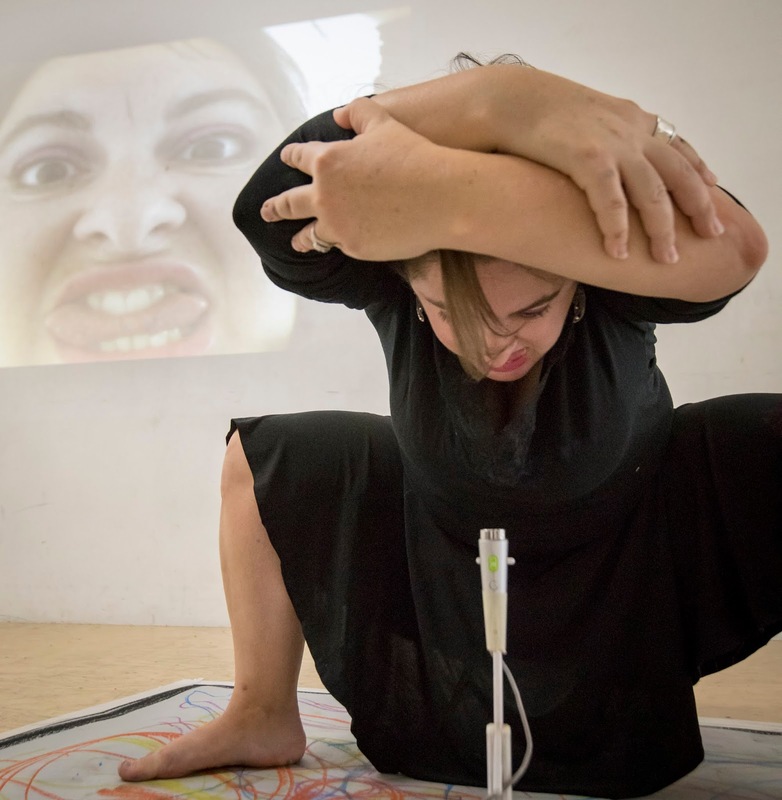 She's all there, a force of self-determination, and that serves her well in her vivid new solo, No more beautiful dances, a world premiere for La MaMa Moves! It's a generous presence in which Lenzu--plunging headfirst into performance after a long time focused on making work for others--ramps up what it means to be a dancer. It means your body speaks for you; it is your art, one vulnerable to the judgment of others as well as your own, offered up for display and assessment. Lenzu aims to stay honest about all that. With the audience as witness, she desires to serve, too, as her own outside eye. She marks thick lines in menstrual red around her feet and thighs, outlines she will then fill with the same color and with furious energy. She allows two live-streaming cameras--one from above, one from below--to snoop around every surface and crevice of her 42-year-old body. This reads a bit like feminism of the My Body, My Self kind, an effort to take look at herself, journal what she observes, understand and come to grips with the changes undergone with the years and after giving birth to her two kids. With the help of director Daniel Pettrow and the mentors she will cite after the show, this "journal" has been distilled down to about 40 minutes. But it encompasses so much--all that can be seen and all that needs to be imagined upon reflection of the viewer's own history. It stretches across the walls of The Downstairs theater's waiting area where blown-up, drawing-enhanced selfies of the dancer have been hung. It includes Lenzu's sturdy, expressive movement, of course, and her husband Todd Carroll's video projections but also Lenzu's speaking and songs recalled from her Argentinian youth--all to recapture a grounding sense of a self almost lost here in a new land. In her post-show chat with Pettrow and the audience, Lenzu answered the inevitable question about her title, No more beautiful dances, by calling it a warning: "This dog will bite you." Oh, yeah, I get that. When I first read the title, I thought of it as: "No more beautiful dances...for YOU, MISSY!" I also could not help but hear a poignant question: "Am I no longer able to make beauty?" "No more pretty dances. Ah, but beauty...!" No more beautiful dances has a final performance tonight at 7pm. For information and tickets, click here.